Located between the Flatiron and Union Square Park, abcV is the definition of whole foods plant-based cuisine. It is a refreshing take on vegan/vegetarian food in the US where processed vegan food are favoured and often used. Vegetables and legumes are the stars of the dishes as they do not use any mock meats or cheeses. The dishes are light, colourful, fresh and creative. Their ingredients are "plant based, non GMO, sustainable, artisanal and organic whenever possible." "abcV is here to serve, inform and inspire a cultural shift towards plant based intelligence, through creativity and deliciousness." My personal favourites for brunch are the dosa with avocado & coconut yogurt and steamed tofu. For dinner and lunch, the grilled Donko Shiitake, Green Chickpea Hummus and the Roasted Cauliflower with Turmeric-tahini and Pistachios. As for dessert, finish off with the Matcha Crème Brûlée. For a more detailed post on AbcV check out my separate post on Brunch at AbcV. TACOS. Need I say more? But seriously, these vegan tacos are just as good, if not, better than regular tacos, taste wise and health wise. Instead of serving tacos with meat and dairy alternatives, all the food here are prepared with plant-based ingredients; you won't find any faux meats or Daiya cheeses here. With these naturally colourful dishes at a reasonable price point, Jajaja is a great place for friends to grab a bite together. My must haves for starters are, hands down, Nachos with extra guac. It is so good that everyone, vegans or non-vegans loves it. I once heard an older lady at the next table (who was clearly not vegan), say to her vegan daughter "wow this tastes better than regular nachos!" As for the Tacos, my top three are the Mezcal Mushroom, Palm Carnitas and Buffalo Flower. My go to dessert is the Raspberry Trisome Cheesecake which is very light and refreshing. I'll admit, I was a little skeptical when I first heard about Beyond Sushi, after all what's sushi without fish? Sushi was one of my favourite foods before I went vegan and all the vegetable rolls I've had didn't give me quite the same satisfaction. However, after my first bite of beyond sushi I understood why it's so popular even among non-vegans. It is a modern approach to traditional sushi with ingredients like black beans, artichoke, chickpea, sun-dried tomatoes, etc. They've expanded their menu at the w 37th st sit down location with more delicious items like Sunchoke Farro and Eggplant pictured below. "Beyond sushi is the pioneer of the plant-based sushi movement. A 100% vegan eatery that celebrates the flavours and beauty of locally-sourced seasonal produce"
My personal favourite rolls are La Fiesta, Chic Pea, and Sunny Side. Keep your eyes out for the seasonal roll as my all time favourite roll was the seasonal roll of last fall/winter which was made with coffee-roasted Kabocha Squash! All the dumplings are amazing but Smokey Tom is always my go to. This little eatery in East Village will make you rethink vegan food. Avant garden transforms vegetables into the main event of the evening with combinations that hit just the right spots. All the dishes are created with whole foods rather than meat or dairy alternative. The seemingly simple menu is in fact dynamic and bursting with flavour. 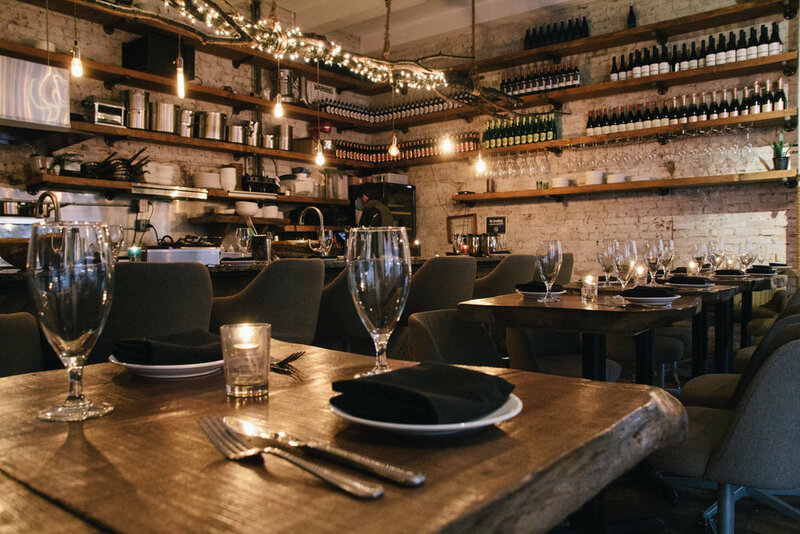 It is a little gem for those looking to have a more refined and upscaled vegan dining in New York. My must haves are the Celery Root, Roasted Carrots, and Broccoli for the hot dishes. Any of their signature toasts are great but my top two are the Sunchoke and the Cremini Mushroom. As for dessert, they don't have a set menu but for the two times that I've tried their dessert of the day, (olive oil cake and white truffle ice cream with pistachio cake) as good as they sound, they were the least exciting dishes of the meal. 2. Donating 100% of profits to sustainable charitable work locally and overseas. I'm usually not a big fan of sweet things but the french toast was not too sweet, very soft and had lots of strawberries (which I love). Again, I rarely eat fried things but the Truffle Fries were very good and had me wanting more. So props to them for getting me to want to eat things I usually would not eat. "PS Kitchen dishes out sophisticated vegan fare using fresh, organic ingredients." Although my first experience at P.S. Kitchen was great, I'm sad to say that the food was not on par the second time I was there. The French toast was over done and not fluffy and soft like the first time. My friend's match waffle was also too hard and we both struggled to cut into our food (which is not fun). While most of the reviews are good, it seems that there are times when the food can be a hit or miss. I will, however, return for dinner as most people speak more about the dinner dishes than they do about the brunch dishes.